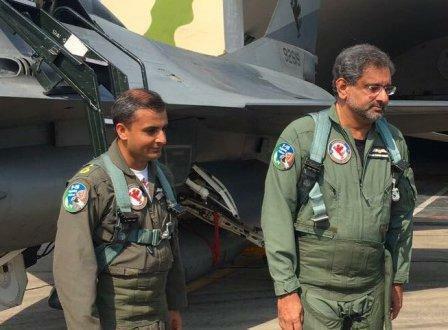 In a first for any prime minister of Pakistan, Shahid Khaqan Abbasi on Saturday participated in an exercise training mission aboard an F-16 aircraft as part of the elite No 9 multirole squadron. In full flying gear, PM Abbasi sat in the rear cockpit of the fighter jet. It was during a visit to the newly established 'Airpower Centre of Excellence' at an operational airbase of the Pakistan Air Force (PAF) in Sargodha when the prime minister took part in the mission. Chief of the Air Staff Sohail Aman, sitting in another F-16 aircraft, also participated in the training mission. After landing back, Mr Abbasi interacted with the combat air and ground crew of the squadron. He lauded the high morale of the aerial defenders while expressing satisfaction over the PAF's operational readiness. He was briefed on various contributions of the air force, especially during disaster management and relief operations, and told that the new facility was equipped with state-of-the-art facilities and infrastructure. Besides training the PAF personnel, the institute would train the combat crew of friendly air forces by conducting multinational training exercises, Mr Abbasi was apprised. He was briefed on the ongoing 'Saffron Bandit' exercise. The first multinational exercise will be held in October in which personnel from over 19 air forces will participate. The PAF chief, who received the prime minister on arrival at the base, briefed him about the PAF's contribution to nation-building. The PAF has started numerous vocational institutions all across the country to create job opportunities for the youth. As regards the PAF's contribution to the promotion of education, the prime minister was told that various campuses of Air University and Fazaia Medical College had been set up in different cities to provide quality education to young boys and girls. Schools have also been set up for special children to make them useful members of society. The prime minister took keen interest in the Aviation City project, which has been established in Kamra to bring in an innovative approach to the aviation field. The project would focus on research and development initiatives.